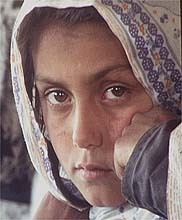 A girl in rebel-controlled Afghanistan from the documentary "Jung: In the Land of the Mujaheddin." Find additional information by selecting from the following topics. Thomas Friedman on Terrorism presents six of Mr. Friedman's Op-Ed columns on the threat of terrorism facing the U.S. prior to the attacks of Sept. 11. Read now for just $4.95. IMES have changed since "Jung: In the Land of the Mujaheddin," a documentary made by three Italian filmmakers in Afghanistan, had its United States premiere at the Human Rights Watch Film Festival in New York in June. "Then, people were still asking us, `Is there a war going on in Afghanistan?,' " recalled Giuseppe Petitto, the film's editor and line producer, speaking by telephone from his Rome office. "They're not likely to ask that now." Jung means war in Dari, one of the main Afghan languages. The film, which opens in New York on Friday, is a searing portrait of the devastation brought on by two decades of armed conflict in a land that until recently most people had forgotten. It is a vision of Afghanistan that the policy analysts and retired generals on news broadcasts cannot begin to offer: a remarkably intimate look at the human costs of war. The camera captures a turbaned man standing in the harsh landscape of Afghanistan's Panjshir valley amid an endless crowd of refugees fleeing the northward advance of Taliban troops. His voice is hoarse but urgent, his face haggard. "Other peoples' wars have ended," he says. "Why doesn't it end here?" "Jung" offers no answers to his haunting question. Instead, it follows three people — a doctor, a war correspondent and a nurse — trying to set up a hospital in territory loosely controlled by a federation of Islamic guerrilla fighters (or mujahedeen, as the term is often transliterated) known today as the Northern Alliance. The story begins in February 1999, when Mr. Petitto and the film's co-directors, Alberto Vendemmiati and Fabrizio Lazzaretti (all in their mid-30's), arranged to travel to Afghanistan with Ettore Mo, an older Italian journalist who had covered the country since 1979, when Soviet troops joined an ongoing civil war. Gino Strada, a surgeon and the founder of Emergency, an international aid organization for civilian war victims, and Kate Rowlands, a British nurse and Emergency staff member, joined them. A rickety Soviet-era helicopter carries them from Dushambe, the capital of Tajikistan, across snow- capped mountains and into a desolate valley where mujahedeen greet them. Continuing by truck, they pass bands of armed men, wraithlike figures of fully-veiled women and the scattered wreckage of ruined tanks before arriving at the home of Burhanuddin Rabbani, president of the Northern Alliance. Strangely impassive, with his white beard and turban, he grants Dr. Strada permission to establish the hospital. The group tours the region's sole working medical facility, at Charikar. Balls of dung serve as fuel to heat the rudimentary operating room. Many of the patients are children, their wounds the hellish harvest of land mines planted by Soviet, Taliban and mujahedeen forces. The most common procedures are amputations, sometimes graphically depicted. Charikar, near the front lines, is frequently shelled by the Taliban. Standing outside, a little girl calmly explains how bombs hit her house, leaving her arm a bandaged stump. In the market, small boys labor as blacksmiths, and destitute widows beg. Under fire in the trenches, a ragtag army shoots back haphazardly while tiny figures across the valley recede into the distance. Even the amusements appear sinister. To entertain a crowd gathered in celebration of the Islamic New Year, one man eats shards of glass while others play the ancient game of Buzkashi, competing on horseback for a calf carcass, and tearing it asunder like their homeland. For the filmmakers, the most difficult moments came in July 1999, when a massive Taliban assault on Charikar and the Shamali plain threatened to make Emergency's plans for the hospital a casualty of the crisis. But a 75-minute version of the film, broadcast on Italian television that June, had already generated $200,000 in private donations. A new location was chosen in the town of Anobah. "At the end, the hospital and the film became the same project for us," Mr. Petitto said. The filmmakers also interview Ahmed Shah Massoud, the "lion of Panjshir," a mujahedeen leader killed on Sept. 9 by assassins believed to be associates of Osama bin Laden. Vikram Parekh, a researcher on Afghanistan at Human Rights Watch, admires the film but is troubled by its uncritical stance toward Massoud's Northern Alliance. "The film shows people who are victims of indiscriminate bombing by the Taliban," he said. "But it never mentions that Massoud's forces had also carried out such attacks on Kabul, without regard for civilian casualties." Though the Taliban's record of human rights violations far outweighs that of the Northern Alliance, "all sides have committed abuses," he said. "And neither has demonstrated a popular mandate to govern." Speaking by satellite telephone from Anobah, where the hospital is still functioning, Mr. Vendemmiati explained his position. "Being a filmmaker means dealing first of all with human passions and feelings," he said. "You have to be part of the reality you are describing. We were trying to understand what it means to live in a country where the war has been going on for 20 years. We were more interested in that, rather than in trying to finding out who was politically responsible." Mr. Vendemmiati and Mr. Petitto met when they were film students in Rome. They directed one feature together, then joined forces with Mr. Lazzaretti and made several short television documentaries. For "Jung," they spent seven months in Afghanistan over the course of two years, creating a rare glimpse into this remote culture. Iranian directors like Mohsen Makhmalbaf with "Kandahar" and Majid Majidi with "Baran" (both to open in the next few months), have dramatized the plight of women under the Taliban and Afghan refugees in Iran, by far the country's largest immigrant group. Both are fictional films shot on the Iranian border. The second half of "Jung" shows the hospital in action, with a local staff drawn largely from the handicapped victims of mines and war. About 30 percent of the hospital workers are women. Dazed mujahedeen arrive from the battlefield for surgery. Dr. Strada tries to convince them not to return to combat. One young soldier has his leg amputated; months later, the camera reveals him fighting at the front. "It's his profession," Mr. Petitto explained. "Out of 10 people that you treat, probably five will go back to fighting. And five will understand that that's not the right way. Creating a hospital is not just making a place where people can be treated. It s also making room for new ideas, a different way of living together." On the telephone from Anobah, Dr. Strada concurred. "Less than one-third of the Afghan population has access to any kind of health facilities," he said. "So a hospital becomes a place where we can practice a few human rights that are basic to everybody." "Jung" also shows a man receiving treatment for acute melanoma. The cancer has eaten away at his jaw. "We thought it would be a good metaphor for this country that is dying from the cancer of unending war," Mr. Petitto said. "We see in his face the fate of Afghanistan." Yet even this ruin of a man reaches behind his bed to find an apple for his small son. Much of "Jung" is told from a child's perspective. In one wrenching scene, a 4-year-old girl carrying a bag of apples arrives alone at the hospital to visit her grandfather, a grizzled mujahedeen who has lost his leg to a landmine,. "She's come to see . . ." he says, before his voice trails off in desperation. Her wide eyes appear huge in her tiny face. Emergency ran a hospital in Kabul for a short time last spring, before a brutal raid by Taliban moral police caused the association's Milan office to close it. But Dr. Strada has been negotiating to reopen it and hopes to return there soon. Mr. Lazzareti and Mr. Vendemiatti plan to accompany him. "For me, a child at ground zero and a child in the bazaar at Kabul have the same face," Dr. Strada said. (The Web site www.Emergency.it lists more than 100 civilian victims of the past month's bombing, compiled by the organization's nurses in Kabul.) "You cannot have categories of victims, A, B and C," he added. "Either human rights are valid for everyone or else they're just privileges." Leslie Camhi writes from New York about film, art and books. One dozen Candy Cane Roses - only $29.99! Click Here to receive an introductory offer to The New York Times Electronic Edition.